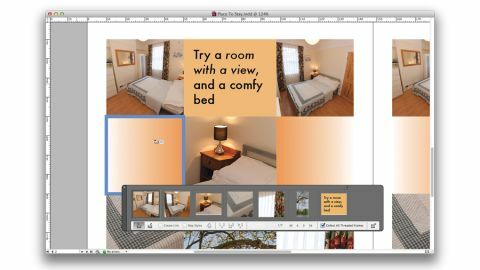 The new InDesign CS6 shows Adobe's commitment to design and page layout. The new features InDesign boasts are intended to make life easier for busy layout production work and also for anyone making page designs for more than one final format. Everyone in the DTP field is being asked to do more kinds of work than ever before - and not just taking pages onto iPads, although that's definitely something we hear regularly. Repurposing layouts into new page sizes is where the Liquid Layout feature comes in handy. This lets pages be reshaped and the contents adjust, slide or resize to fit into the new dimensions. It's a strange thing to see, but it works well - and much better than the Layout Adjustment feature that's been around in previous InDesign versions. You use the Liquid Layout window to tell objects whether they should grow, be pinned to sides of the page, or simply do an 'auto fit' that leaves the decisions up to InDesign. Then use the Page Tool to pull the page into a different shape. This way you can preview how things will change when the document is resized, or when a new 'alternate layout' is made from the current one. Alternate layouts finally make iPad layouts a little easier to manage. These put different layout page sizes into the same document. You can choose which set of pages to see, or show more than one set at once by splitting the window. The Pages palette shows the different layouts in a document. If you need to make multiple versions of a layout, this is great news. But watch out, if you add a page into one layout it isn't automatically added into the other: there is no synchronisation. The Content Collector is another powerhouse trick for busy production staff. Choose this tool - the only new icon in the Tools palette - to show the Content Collector window, then click on items to add them to it. Switch to the Content Placer tool and you can place them back on the page in the order they were collected. This is perfect for copying lots of items from one document or layout to another. They don't stay in the Content Collector when they're placed again, so this feature doesn't replace the Library for storing master copies of items. Think of it as visual copy and paste on steroids. Another new feature is the ability to insert HTML content as objects into a page layout. This means more options for making iPad folio documents or EPUB books, but not so much for print work. Exporting to PDF with HTML items in a layout created black boxes in our tests, even with simple text. It also didn't let us put more than one portion of HTML into a document at once: every HTML item ended up with the same content. More impressive is the ability to make PDF forms from inside InDesign CS6. It is actually easier to make them here than in Acrobat Pro, although it is still something you will need to take time to understand. Select an item and use the Buttons and Forms palette window to set up the form item type and behaviour. Text boxes can be turned into form fields, even password ones, and graphic buttons and checkboxes can be set. Teething bugs aside, InDesign CS6 seems to be a robust and useful upgrade. If you don't specifically need the key update features then you probably shouldn't get too excited about this. But if you do, well, they should make your life much easier - once you get your head around how to use them properly.